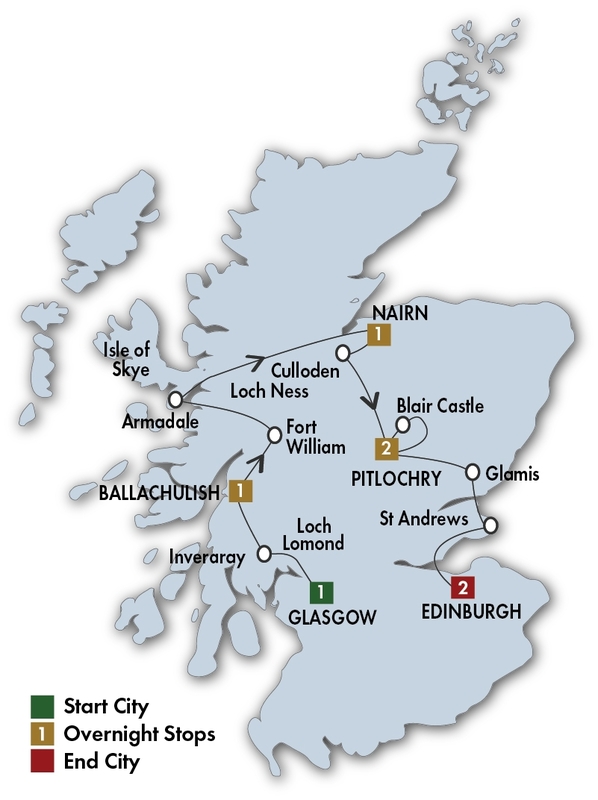 Fully Inclusive Vacations  Enjoy Scotland at its best! Choose value-for-money first class programs, splurge with deluxe properties or find something in between. 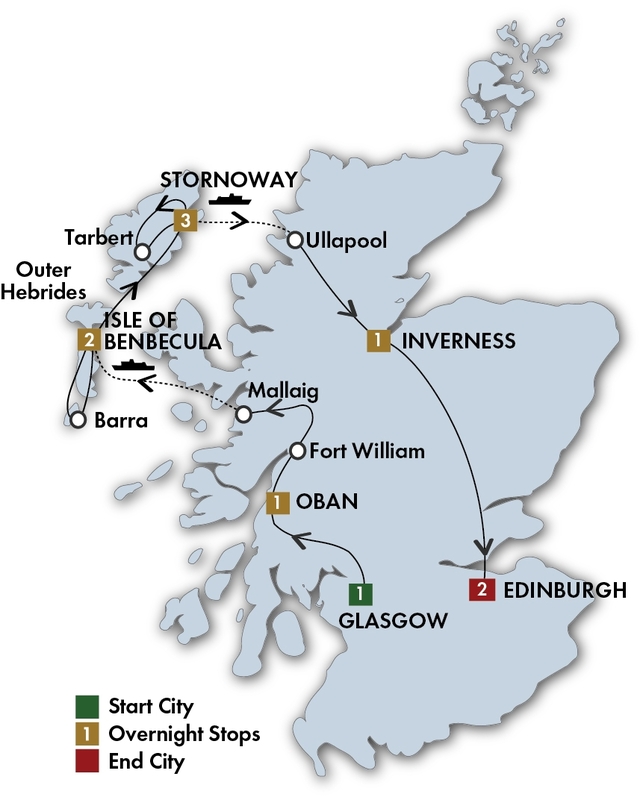 All of our quality escorted coach tours to Scotland feature prepaid daily sightseeing, excellent hotels, full breakfasts, most dinners, including specialty dinners with entertainment and, most importantly, no hidden extras! Our tour guides do not sell any optional tours so that they can focus 100% on your vacation enjoyment! Discover More on a Small Group Departure. Select tours below offer you this exclusive experience with an average of just 24 guests on select departures. Please continue through to the Dates & Prices page of the tour for individual departure dates. 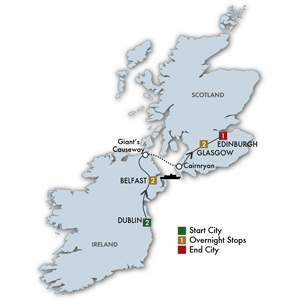 Need help deciding which tour is right for you? Just call us at 1-844-231-9285 to discuss with one of our friendly CIE Tours travel advisors. 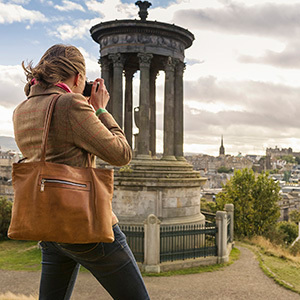 Journey through Scotland, where legends and charm meet the stunning countryside. 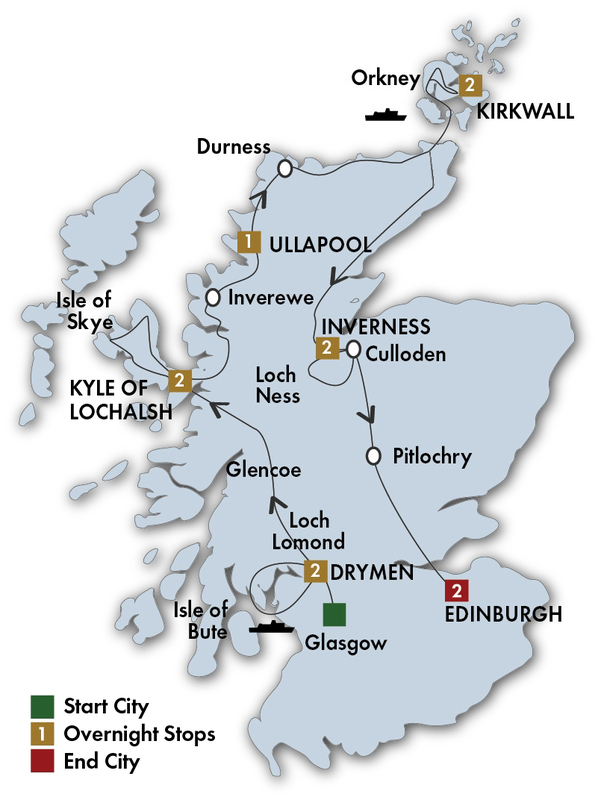 Experience the beauty or Loch Ness, as you relax on a cruise on this famous body of water. Visit the ruins of Urquhart Castle, once the largest in Scotland and enjoy tours of Edinburgh. Discover the whisky making process at a local distillery, ending with a dram to sample. 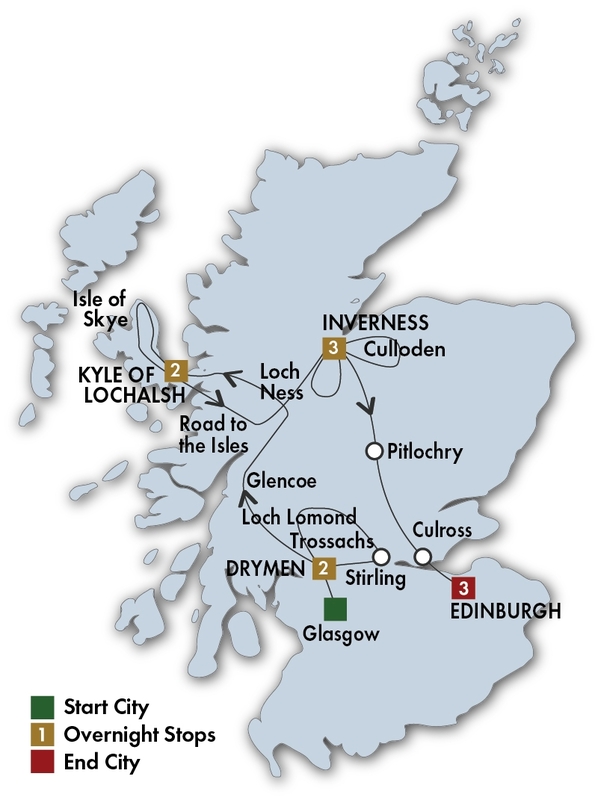 This classic tour of Scotland starts in Glasgow and explores the Isle of Skye, Loch Ness with plenty of wonderful scenery as you travel through the Scottish Highlands. Discover castles, watch skilled sheepdogs and cruise Loch Lomond. Stay in elegant manor house hotels, including the special Atholl Palace Hotel. See Edinburgh Tattoo in August. 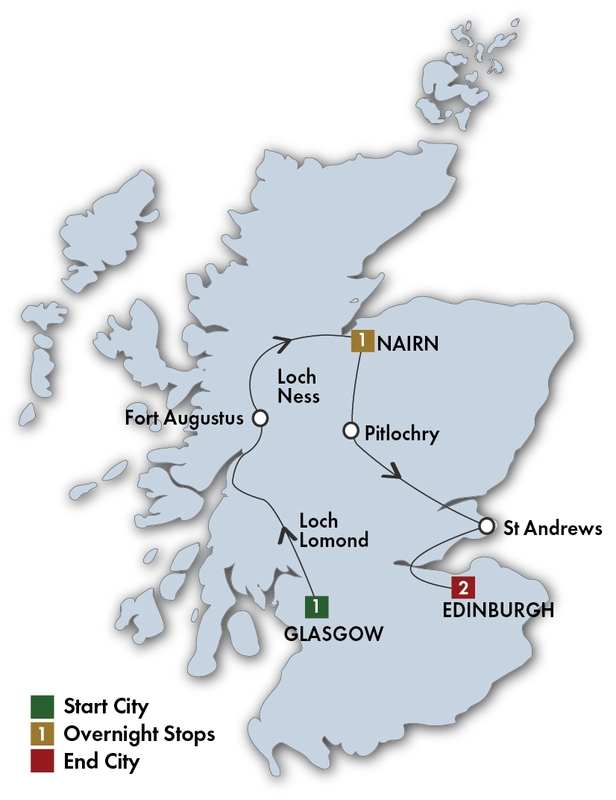 The focus of this tour is on the history and scenery of the Scottish Highlands. Travel at a leisurely pace to absorb history and experience gentle lake cruises, the dramatic scenery of the Isle of Skye, Harry Potter movie locations and a train ride along the Road to the Isles. See lots of castles of different styles and sample whisky in a Speyside distillery. 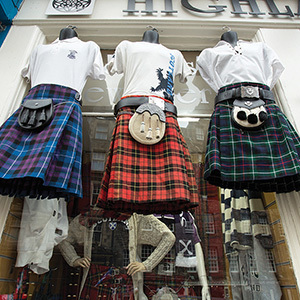 Edinburgh’s spectacularly rich architectural heritage is wonderfully matched by its status as a thriving cultural hub. With plenty of independent bookshops, a growing restaurant scene, and fantastic nightlife, this beautiful city will energize and inspire you. Edinburgh does New Year’s Eve like no one else – There are street parties and festivities, fireworks at midnight, and a national sing-along of Auld Lang Syne!